Colour is all around us and yet there are times of the year when you look out of the window at the garden and see only versions of greens. I call these times ‘Green Lulls’. This often occurs when there is a gap between one set of plants that have finished flowering and before the next group begins. Sometimes those ‘Green Lulls’ can be rather extended when your garden only has plants for a particular season or you don’t have enough space to have year-round interest. So here is how and when to use garden pots and containers in your garden for an instant burst of emergency colour. ‘Green Lulls’ are telling us something. The most obvious is that you do not have balanced planting but sometimes, they are giving you a warning too. It could be that you are confident that you’ve got a well- balanced border that’s taken time and effort to establish but have been recently been distracted from what is happening in the garden for all those other reasons that fill our days. Slowly and steadily because there is nothing to restrict it, one or some of those garden thugs albeit beautiful ones, of which we have many, quietly begin taking over the available space at the expense of some of the less robust plants. This will throw the balance of your borders out, resulting in some periods of tired green. I once saw a garden that no other plant in it except Lysimachia punctata (yellow loosestrife) because it had gradually taken over and the owner didn’t notice, due to being away a lot, till it was too late. Obviously, this is an extreme case but if you leave this sort of thing unchecked, you will get the same result. So, look out for those Green Lulls. Now that we’ve established that ‘Green Lulls’ are telling us something, what is the solution? Being the gardener that you are, I’m sure you will identify why your garden is looking tired and green and put it right for next year but in the meantime, you need some emergency colour for now. This can be achieved by planting up a pot or two, using plants from the garden centre that are in flower right now. This is the only time that you will hear me advocating going to the garden centre and buying whatever is in flower without applying the 3 Foundation steps I advocate in my book ‘The Garden Equation. How to make your garden into a delightful part of your lifestyle’ and which I believe every beautiful garden is based on. It is not the most economic way of introducing colour either but this is an emergency! Why is it an emergency, you say? Well, there have been many studies proving the positive influence on our well-being that looking at colours have. I’m sure you have had down days that have been lightened even just a little when you’ve looked at a lovely garden. I know I have. 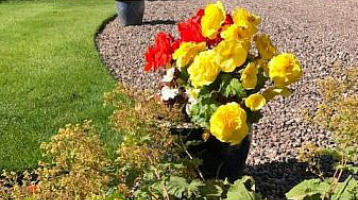 So, on the basis that it could be quite a long time before your garden becomes colourful again, you need to introduce some now and this can be done quickly and easily by planting up some pots – now or whatever time of the year you have a ‘green lull’. Look at the photo with this blog. In the foreground you will see the tired, faded flower heads of Alchemilla mollis and behind it several pots of Bergonias. There is nothing subtle or thoughtful about this composition as it is made up of plants that were being sold off the local garden centre a few weeks ago but I’m sure you can see how the colours in the pots lift what would otherwise be a very boring and quite frankly, a bit of a depressing scene. ‘The Garden Equation – How to make your garden into a delightful part of your lifestyle‘. You can get your copy by registering your details on our homepage. You need to scroll down to the bottom of the page to find it, so don’t give up! If you have already registered for a book but not received one, please email me on the link below and let me know. We’ve been having problems with the system – which we’re doing our best to put right. If you’d like to fill in a contact form me with any questions, click here and I’m very happy to help you if I can. If you would like to talk the garden through with someone who is knowledgeable, experienced and objective get in touch for more information about our 2 levels of FIXED PRICE garden packages. We’re also very happy to visit you and your garden for an initial discussion. The first visit is FREE so long as you live in Yorkshire. PS – If there is anything common sense garden-related issue that you’d like to have aired to a wider audience, please use the contact form.